Whitehill and Taranga farms, the names given to the northern and southern sections of this land, are located 2 km north of McLaren Vale overlooking the township. Taranga is a corruption of the aboriginal word Tarangk, meaning the middle which was used by the Kaurna, a local aboriginal tribe. Sheep and cattle were raised and orchards and vineyards were planted immediately upon arrival and the family prospered. William and Elizabeth are buried in a marble crypt, with three of their ten children beside them, in the family cemetery on the northern edge of the Taranga property. Both properties are still run by fifth generation descendants of William and Elizabeth, with the White Hill property utilized for cropping and grazing sheep and cattle and boasting a rejuvenated stone Chaff Shed which is used as a function centre and Taranga, which consists of 110 hectares of land, being planted to many different varieties of red and white wine grapes. The McLaren Vale wine region is fortunate in that it is bounded by the Sellicks Hill Range and the waters of Gulf St. Vincent generating temperate growing conditions required to produce top quality fruit more consistently than other regions. McLaren Vale is also located a conveniently short hop from Adelaide beside the beautiful beaches of the eastern side of Gulf St. Vincent and en route to the fabulous Fleurieu Peninsula tourist attractions. The region is relatively small with a wide variety of soils. On the Taranga property the soils are sandy loam over clay and limestone with evidence of ironstone throughout. Along with good old gut feeling, which comes from years of knowing the vines and terroir upon which they are grown, radio controlled and computerized soil moisture monitoring systems are used in conjunction with information gathered from the winery's own weather station to administer the appropriate amount of water from each of the four different water sources available. State of the art computer controlled irrigation technology is used to administer the optimum stress levels to the vine to produce premium quality fruit. Each block is individually nurtured depending on variety, vine age, soil, location, winery requirements and the targetted bottle range. Grapes grown on the property are primarily supplied to up to seven different wineries, with many varieties making top wines under their labels. From 1994, some of these low yielding, high quality, old vine grapes have been processed with some outstanding results, setting the scene for Olivers winemaking ventures. 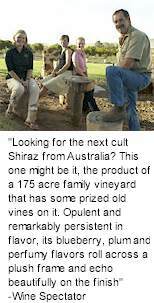 Oliver's Taranga Vineyards wine is sold within Australia and exported to countries in Europe and Asia and to the USA, Canada and New Zealand. Oliver's Taranga Vineyards is currently run by Don Oliver (Owner/Viticulturist), Corrina Rayment (Winemaker), Margie Oliver (Sales/Admin Manager), Craig Deacon (Supervisor), Brioni Oliver (Marketing) and a band of many, merry, multiculturals coming and going.